The diesel-powered Lazer Z mowers make quick work of the largest, toughest jobs and raise the bar for cut quality, operator comfort, fuel efficiency and ease of handling. Available with 60", 72" and 96" cutting decks. Our Lazer Z’s are considered the gold standard in commercial-grade, zero-turn excellence. Built for easier maintenance and longer life, Lazer Z mowers are simpler, tougher and easier to operate. 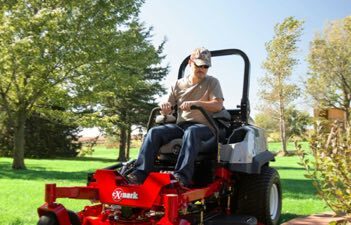 The next great zero-turn mowers deliver the commercial durability, reliability and comfort that you expect from an Exmark mower, at unbeatable value for commercial landscapers and acreage owners alike. 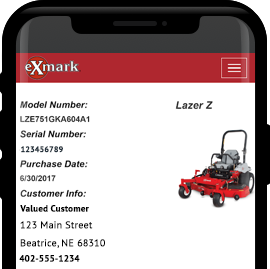 Exmark offers a wide range of optional accessories designed to help you get the most value out of your machine. We understand the importance of keeping your equipment up. Only Exmark has the expertise and know-how to provide the right parts specifically designed for your machine.